A safe retirement will be a "dream" for many . 40 years ago, 84% of all private-sector American workers had a corporate pension plan. Today less than 28% do. "Hedge fund titan Ray Dalio published a sobering essay last Friday about the state of capitalism in the U.S....(..) Dalio then went on to present myriad data showing that many Americans make too little money to live on, let alone save, with harmful consequences. He counts among them diminished health, education and economic mobility, high rates of incarceration, and widening wealth and income disparity that raise the risk of social unrest. In an interview with 60 Minutes on Sunday, he called it “a national emergency.” The problems Dalio identified can already be observed in much of his data, but another one is coming, and soon. Many Americans can’t afford to save for their future, and with baby boomers leaving the work force in big numbers, millions will spend their retirement in or near poverty. Unlike many of the thorny problems cited by Dalio, however, this one has a simple solution and it doesn’t involve exorbitant expense. The Government Accountability Office recently updated its sweeping 2015 report on retirement security in America. 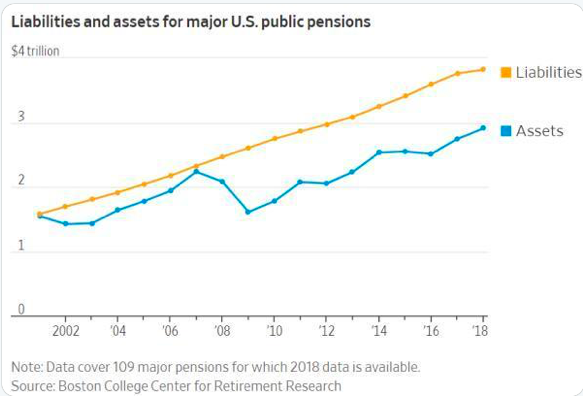 The new numbers are no more comforting than the old ones, and the most worrisome among them is stubbornly consistent: 29 percent of households aged 55 and older have no retirement savings and no pension. It’s a bigger number than it seems. The 65-and-older population is projected to be roughly 74 million in 2030, according to the Census Bureau. If nothing changes, more than 21 million of those retirees will have to rely on Social Security, a meager income. ..."
Does Wall Street have anything to do with it? 10 most-asked retirement questions, past year U.S. The list starts with - 1. How much do I need to retire? and ends with 10. Where to retire? Tax breaks for corporations and the rich must be the answer.